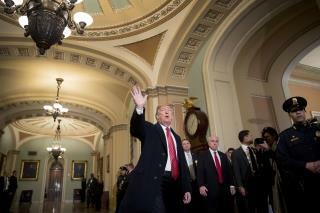 (Newser) – President Trump hastened to Capitol Hill Wednesday trying to hold jittery congressional Republicans in line on the 19th day of the partial government shutdown. He suggested a deal for his border wall might be getting closer, but he also said the shutdown will last "whatever it takes." Beyond his cautiously optimistic comments, there was little other evidence of an end to the impasse over his demand for $5.7 billion for a wall at the US-Mexico border. He claimed he had "tremendous" support from Republicans, but GOP senators are publicly uneasy about the toll the shutdown is taking on everyday Americans, including disruptions in payments to farmers and trouble for home buyers who are seeking government-backed mortgage loans—"serious stuff," according to Sen. John Thune, the No. 2 Senate Republican. Trump was to get a personal sense of the concern—and perhaps questions about his strategy—from those in his own party at the US Capitol on Wednesday. Late in the day, Democratic and Republican congressional leaders were to return to the White House to meet with him and renew negotiations that have shown no apparent progress in the past week, reports the AP. Democrats said Wednesday they will ask Trump during the meeting to accept an earlier bipartisan bill that had money for border security but not the wall. House Speaker Nancy Pelosi warned that the effects of hundreds of thousands of lost paychecks would begin to ripple across the economy. I agreed with Obama shutting down govt to pass Obamacare, and I agree with shutting down till we get a wall as well. Yes,lets remind everyone that Dems shut down govt when they didnt get their way.